The Pullo Center at Penn State York welcomes Robin Spielberg, CD Release Concert to its stage on Friday, April 18, 2015, at 7:30 p.m. Ticket prices are $27 and $20 and will go on sale today at 10:00 a.m. Tickets can be purchased at The Pullo Center Box Office, charge by phone at 717-505-8900, or online at ThePulloCenter.com. 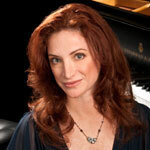 Steinway Artist Robin Spielberg is releasing her 17th CD this month and The Pullo Center is proud to present the Pennsylvania premiere of Robin's newest works from her brand new release "Another Time, Another Place." An artist with a talent with words as well as music, Robin Spielberg's concerts always intertwine musical performance with stories that inspire, enlighten and make us laugh. Thousands of people have been both entertained and touched by Ms. Spielberg’s live concerts; her natural talent for making audiences immediately comfortable transforms what could easily be an ordinary evening at the concert hall into a very special concert event. “Robin has such a personal and expressive way of playing, and her story-telling about the origins of the music makes the pieces come alive...the evening was both touching and mesmerizing” writes Wind & Wire Magazine of Robin’s San Francisco area concert. “Robin Spielberg has an undeniable melodic gift” says New York Concert Review of Ms. Spielberg’s Carnegie Hall debut. A prolific composer, Spielberg has sixteen recordings to her credit and appears on over 40 compilations around the world. Her discography includes albums of original piano solos, arrangements of American standards, original pieces for piano/ensemble, recordings for the holidays, a CD of Americana melodies, and a CD of lullabies. Spielberg’s debut recording on her own playMountain Music label, Dreaming of Summer, topped charts in Thailand, China, Hong-Kong, Korea and Malaysia, with one of the tracks also gaining popularity with audiences from its use as a soundtrack in the Korean award-winning television drama Winter Love Song. This track, Spielberg’s creative and compelling improvisation on the Canon in D has been Robin’s best-selling download on iTunes for fourteen years.